Cities, like nature, are all about the details. Granular. Fine-grained. Cellular. Each of these describes what we see in cities as unique, what defines them as places: small details that differentiate them from anywhere else and add up to a web of connections we call the city. I am writing this from Paris, a city marked by its idiosyncrasies. Small café-lined streets, grand boulevards, majestic parks. And dogs, everywhere. The grand planning that created this wonderful city is home to global institutions (like UNESCO, my host) as well as thousands of small enterprises and exceptions, creating an urban topography instantly recognizable as Parisian. On the street of my hotel there is a small library, an organic grocer, a wine bar (of course), a lawyer’s office, an automobile showroom, a pharmacy, and several cafes that open out with lines of chairs facing the street. The architecture is a hodge-podge of classic eight-story windowed residences with street-level retail, and brutalist cement edifices. Again, essentially (post-war) Paris. Gazillions of writers have described what makes Paris Paris. As my fellow urban ecologists on these pages continue to argue, what makes up the true nature of any city is never just one thing; it’s about the mix, the interplay of leadership, individual initiative, planning, serendipity, creativity, natural topography, mistakes, time. Fundamentally, it’s about people. Cities are made by, and are for, people. Individual agency—the capacity to act upon one’s environment and affect it—is what continues to make our cities work well, to be livable and resilient, and permit us to meet our needs and realize our aspirations, both individual and collective. This is what I referred to in my previous post on this site as self-organization. I want to expand this here, and make the case for how that process of self-organizing creates granular urbanism, and most presciently granular resilience, which when aggregated up (or ‘scaled’, to use the common parlance) is the key to a city’s capacity to adapt to change and thrive. As I walked to the Metro this morning I peeked through an open door to see a back courtyard, reminding me of the American city that has so much to teach us about granular resilience: New Orleans (NOLA). As part of a fellowship provided to me by the blue moon fund in September 2005, I was dispatched to NOLA and the Gulf, from which the foundation’s wealth had been originally derived, and to whom their President felt they owed a great debt. Before Hurricane Katrina breached its levees, New Orleans was struggling with a stagnant economy and failing public services, notably education, policing, and physical planning. Characterized by some as a ‘perverse opportunity’, Katrina, and tropical storm Rita which followed a few weeks later, stripped away these layers of dysfunction, creating a new ‘ground zero’ to observe if and how a city as troubled as this could in fact self-correct, and bring itself back to be more resilient socially, economically, environmentally, culturally? I wondered what could the recovery of New Orleans teach us about urban self-organization? Were there certain enabling conditions that would first stir and then sustain a renewed city and spur innovation? Would the disconnections and failed civic institutions that entrenched decades of racialized poverty just reappear and continue to compromise the capacity of this city, as an organism, to self-regulate and correct? Or could solutions to the economic, environmental, cultural and environmental challenges the city and region face be integrated, making the city both more livable and resilient? Were there investments that could help to reconnect the city with parts of itself, to strengthen its capacity to better adapt to and anticipate, even, imminent challenges and opportunities? Over time, informed by listening to the locals to spot gaps and their improvised approaches, I began to develop and implement an investment strategy for the fund to support a mix of nascent, ‘bottom-up’ made-in-NOLA responses. Eventually I moved to New Orleans, to support those emergent initiatives and attempt to aggregate the lessons by supporting the creation of the New Orleans Institute for Resilience and Innovation. For the next five years, thanks to a supportive Board of Directors willing to be patient with their capital, blue moon invested in a diverse mix of locally initiated, socially innovative experiments to build the social, economic, cultural and environmental resilience of New Orleans. Often to the consternation of philanthropy colleagues, blue moon’s approach to investing in the recovery of New Orleans was not directed by any pre-set ‘Theory of Change’, other than to support a mix of initiatives that shared a very simple attribute. Each focused on creating connections, an ecosystem of innovation to reconnect the parts of the city with itself, to provide more informed decision-making, collaboration, shared goals and collective impact. Nature with neighborhoods, consumers with the local economy, neighbors with neighbors, neighborhoods with neighborhoods, entrepreneurs with investors. Over time this mix has produced a powerful collective narrative that about how to build granular urban resilience. Given supportive conditions and resources, and an absence of external interference, people living and working in communities will develop innovative, locally effective responses to ‘bring back’ and even ‘build up’ their lives and neighborhoods. A repeated pattern we saw were various forms of community ‘hubs’ which surfaced to serve the particular needs of that group or neighborhood, seeking reinforcement and support and information. A coffee shop, a garage, a church basement, a blogger’s kitchen table: these resilience hubs provided a sense of identity, belonging, common purpose, and formed up in a wide variety of ways across the city. Similarly, there was also the desire to connect beyond one’s own neighborhood, to create forms of connective tissue across difference, linking between neighborhoods and across sectors, which grew with the recognition that the fate of the whole city was dependent on its parts. Faced with pervasive systemic collapses, it was the people in the neighborhoods of New Orleans who were able to return that built this city’s resilience. A few stories follow, with a caveat. New Orleans, like every vibrant and adaptive city, is full of people like these. I am only retelling, and all too briefly, a few with which I am most familiar, to illustrate my point that resilience, and urban livability, are granular, the initiatives of people. Sandy Rosenthal and Levees.org. Sitting at her kitchen table with her teenage son after Katrina, Sandy Rosenthal was outraged that the Army Corps of Engineers had not ensured the federal levee system would protect the city. Their initial investigations uncovered a myriad of design and construction errors, exposing a system totally inadequate to the task of protection with which it was charged, despite repeated assurances from Corps personnel at the most senior levels. Rosenthal has become the most strident voice of alert, challenging the millions of Americans who live within the ‘protection’ of the federal levee system to press for higher degrees of accountability from this federal agency. David Waggoner and the Dutch Dialogues. Combine Rosenthal’s activism with the technical expertise of living-with-water designer David Waggoner, who founded the Dutch Dialogues to promote New Orleans adopting a more integrated approach to managing its water risks, New Orleanians are now much more aware of the challenges posed by their topography and climate. Latoya Cantrell and the Broadmoor Improvement Association. 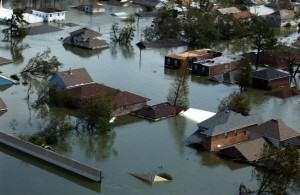 When one of the first reports from the Mayor’s Bring New Orleans Back Commission included the suggestion that the flood-prone neighborhood of Broadmoor revert to a ‘green space’, Latoya Cantrell reacted like her neighbors with a less than polite ‘hell, no’ and began to organize an outreach campaign to bring their neighborhood back, in spite of the Mayor’s Commission. She recruited partners at Harvard to set up a recovery data base, convinced the Carnegie Endowment to rebuild their branch library, found funding to build a new school, and created support teams to work with homeowners and tenants to rebuild their homes. Titling their recovery campaign ‘Broadmoor Lives’, Cantrell was elected to City Council in 2012. Allison Plyer and the New Orleans Index. In the immediate aftermath of the storms, it was very difficult to get ‘the facts’. How many people evacuated? How many stayed? 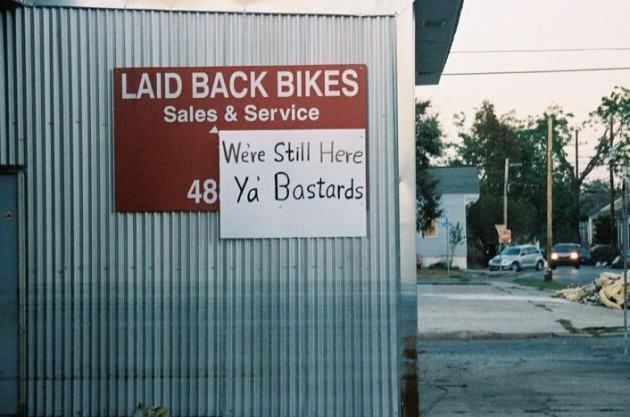 How many were returning? How many dwellings were destroyed? In the recovery business, numbers are everything, affecting insurance premiums, transfers from the federal government, state and local funding, and not to mention tourism affected by the perception of the city held by millions of Americans with vivid memories of immediate post-storm events on CNN. 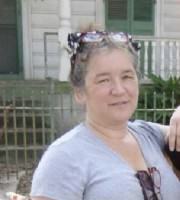 Plyer was the local data cruncher, working for the Greater New Orleans Community Data Center. 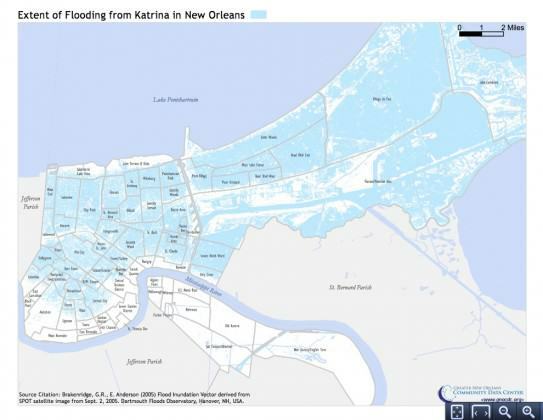 Plyer partnered with Washington-based Brookings Institute, to establish a tracking system to monitor recovery progress, initially calling it the Katrina Index. She urged local non-profit organizations to become more data-driven in their program designs; she challenged the federal government’s census results (and won) to ensure New Orleans received its proper share; and she became the most trusted source of local information, ensuring even CNN’s Anderson Cooper received accurate briefings on his annual visits to mark the city’s progress. Karen Gadbois and Squandered Heritage. Karen evacuated New Orleans lying on the floor of her van, flanked by two dogs. While her husband drove with the ‘counter flow’ (when the highways in and out of town are declared by the Mayor to be only one way: OUT), Karen languished with the heat and the after-effects of the chemotherapy treatments in which she was mid-course. Eventually landing in Austin, Karen would have to renegotiate her treatment protocols (all those records were lost from the public hospital, Charity, which was shuttered) from a distance. At the same time she watched on television photographs of houses flooded in her own neighborhood middle-class neighborhood. After several weeks ‘in exile’ Karen returned to New Orleans, gutted her home, salvaged lost objects that had floated away from her main floor, and grew concerned that houses around her were lingering in the hot fall sun, with owners no where to be seen to begin rehabbing them. A textile artist, she began photographing these houses, many shaped in the vernacular ‘shotgun’ design, concerned that their neglect would lead to their demolition and erasure of local landmarks essential to the way-finding of the neighborhood. With the help of some local ‘techno geeks’ half her age, she set up a blog, and began posting her photos on a blog she named Squandered Heritage. She went on to lead a phalanx of social media activists, whose tracking of the missteps of government recovery efforts became pivotal to the demands for more transparent decision-making and ‘open governance’, a trend in municipal government reform for which New Orleans is now a leader. Gadbois, who prior to Katrina had used a computer infrequently, went on to win a shelf full of the most coveted prizes in journalism, and to co-found The New Orleans Lens, an on-line investigative journalism pioneer, where she continues to work. 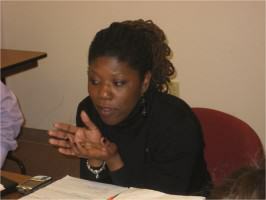 Timolynn Sams and the Neighborhoods Partnership Network. In the post-storm months, New Orleanians often found their evenings taken up with not one, but two or even three different community meetings each night. Taking place in people’s kitchens, backyards, church halls—one of the most enduring was the weekly meeting of the Neighborhoods Partnership Network, which took place every Wednesday evening at the local musicians union hall. With food provided by the legendary southern diner Lil Dizzy’s, NPN attracted all comers—parish priests, FEMA workers, politicians, business leaders, graduate students, newly mobilized neighborhood activists. It became a crucial conduit for neighborhoods to share information, commiserate, and strategize, nd a learning network for residents to build their own capacities as planners and developers of their new city. Sams, who returned to New Orleans after the storm to help the city recover, often described the mandate of NPN to recreate across the city the kind of neighborhood supports made famous by Sesame Street. Dana Eness and The Urban Conservancy. One of the most retold anecdotes in post-Katrina New Orleans is how long it took for the Starbucks to reopen on Magazine street, a popular commercial corridor that bisects many city neighborhoods. While local coffee shops came back quickly, Starbucks remained shuttered for months, as Dana Eness and her Board at the Urban Conservancy would have predicted. Local businesses have a vested interest in getting their businesses back up, because their pay checks come out of the till; they are on the ground and can see solutions; and they have a network around them of suppliers and customers who will work with them to get back. The events of 2005 spurred on the efforts of the Conservancy to make clear the connections between a healthy local economy and the resilience of the city. Whether supporting Louisiana fisherman after the BP Oil disaster, commissioning research and marketing campaigns outlining the multiplier effect of buying locally, Eness has continued to promote the importance of investment vehicles, a supportive regulatory environment, an informed consumer base that supports local businesses, investment, and supply chains, and urban development that reconnects the city with its neighborhoods and natural assets. Tim Williamson and Idea Village. Stagnating for decades with the relocation of oil and gas industry corporate offices to Texas and a rapidly declining population, in the fall of 2005 the challenges to the New Orleans economy seemed almost insurmountable. Although construction would boost parts of the economy for a finite period, Williamson had a premonition that the city was ripe for recruiting and training a new breed of entrepreneur, ones who could create economic and social value. He engaged the local business community, connecting them with the predominantly youthful start-up culture, which was gradually decamping from the scenes in Austin, Boulder and Brooklyn. Adhering to the adage of his organization to ‘trust your crazy ideas’, Williamson began to focus on creating a ‘entrepreneurial ecosystem’ of supports that included training, mentoring, and partnerships with business leaders and business schools across the country. He broadened his definition to include social entrepreneurs, to respond to the many kinds of challenges needing new approaches in the city. Now a recognized hot bed for innovation, Williamson’s latest efforts include incentivizing a new approach to managing ground water, and partnerships with a dozen of the country’s finest business schools, which annually assign their senior students business case assignments from NOLA. His model for economic development is rooted in fostering and growing local talent. Carol Bebelle and the Ashe Cultural Center. For a dozen years Carol Bebelle ran with her longtime partner Douglas Redd, the Ashe Cultural Center, on one of the most historically significant streets in New Orleans: Oretha Castle Hailey Boulevard. Only blocks away from the elegance of St Charles Boulevard, OC Haley stood in the middle of Central City, a notoriously derelict and dangerous part of the city, made only worse by systemic failures that coincided with Katrina. But Bebelle soldiered on, providing a gathering and performance space for artists and culture workers, and after Katrina partnered with one of the city’s mainstream (read: white) cultural organizations, to use the storms of 2005 as an opportunity to discuss an issue that critically divided the city: race. Truth be Told was a series of ‘story circles’—where people gathered to discuss their experiences of race and racism in the city, both before and after Katrina. Perhaps the most profound of disconnections in the city, Bebelle sensed an opportunity, an inflection point, to confront racism in a new way, using the art of storytelling as an ideal medium. Amidst the recovery of the city, Redd died from a long illness, leaving Bebelle to chart a renewed path, which she has done by forming new production partnerships (including with New York City powerhouse Eve Ensler) and refinancing the building in which Ashe was housed, this time to provide artists housing above the Center. Denise Thornton and the Beacon of Hope. Thornton over-stormed inside the Superdome, as a volunteer to support those who had sought refuge in the ‘place of last resort’. After several days of no power and overcrowding, fearing for own life and those in her care, she made a silent pact that if she survived she was going to find a way to ‘give back’. Eventually, she returned home to a house with no salvageable possessions, and no neighborhood, as the homes surrounding hers were equally devastated. Determined, she began the arduous process of hauling her family’s possessions to the curb, removing moldy sheetrock, and finding reliable tradespeople to rebuild. Throughout this process, she relied on the moral support of her close friends and neighbors, finding themselves in similar circumstances. After her own learning curve (which included screaming at a cable repair man atop a pole in an adjacent neighborhood that he must come to hers next), Thornton decided she would open her home to her neighbors for whatever kind of help they needed. With a pot of coffee and a fax machine, Thornton pinned a sign on her door, Come on in: this is your Beacon of Hope. Gradually more and more neighbors appeared. Soon other neighborhoods wanted their own Beacon of Hope, and Thornton and co. helped them set one up, eventually topping out at 17. Neighbor-led teams began to map their streets, identifying which houses needed attention, which parks needed mowing. They pulled together a market for their local businesses to initially come back and vend, while they too rebuilt. They helped seniors find volunteers get their houses fixed. At the height of the recovery in 2007 and 2008, Beacon was annually accommodating thousands of tourists coming to New Orleans wanting to extend their holidays by offering a ‘day of service’. They advised the state and local governments on longer-term strategies to support homes to become occupied. Since then Thornton and her team have advised community recovery efforts in other cities following severe weather events, most recently helping communities in Staten Island to set up Beacon of Hope New York. Pam Dashiell and the Center for Sustainable Engagement and Development. Pam lived and worked in the Lower 9 and Holy Cross, the neighborhoods ‘down river’ that were flooded by the levee breaches on the Industrial Canal and the impact of an errant barge that broke though the wall of cement intended to hold back the water. Pam, an environmental activist, rallied her neighbors to get behind the Holy Cross Neighborhood Association and form the Center for Sustainable Engagement and Development, with the hope of building her neighborhoods back ‘green’. She struck deals with energy companies to finance – and teams of volunteers to retrofit—houses that could be saved, and worked with Brad Pitt and national sustainability leader Global Green to demonstrate the possibilities of building resilient new housing. She built bio-swails to absorb ground water, and helped create a lookout to Bayou Bienvenue, a nearby swamp, so residents could once again see the impacts of salination on the wetlands that had once protected their neighborhood. And she partnered with her neighbors ‘down the Bayou’, the Houma First Nation, on an initiative called ‘How Safe How Soon’, to knit together a better understanding of the inter-dependencies of city and coastal communities. Her partner in this crusade was Houma Chief Brenda Dardar Robichaud, and together these gals and their colleagues were a force of realistic optimism. To Pam, resilience was not a choice, it was an imperative. 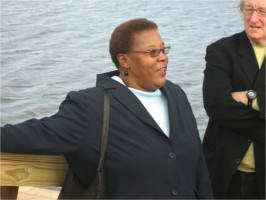 Pam died suddenly, at her computer, in December 2009, the night before she was to address a federal task force public hearing on coastal remediation. These are only a few examples of the hyper-local ways in which New Orleans fostered its own resilience. 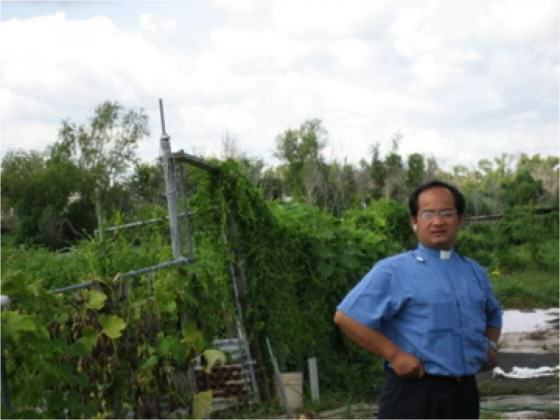 There are many many more, such as community resilience work of the Vietnamese community in New Orleans East, led by Roman Catholic priests Father Vien and Father Luke. The resourceful efforts of Angela O’Byrne and her planning and design colleagues who together founded City Works, a non-profit to connect the best in urban planning and design to the recovery of New Orleans neighborhoods. And the extraordinary work of Richard McCarthy and Darlene Wolnick at reconnecting local farmers, shrimpers and oystermen with the chefs and every day consumers at their weekly markets, which were up and running (accepting local currency and food stamps), in a few short weeks following the storms. Arts to support social change, the importance of small businesses to local neighborhoods, fostering local entrepreneurship as means of creating jobs and solving problems, social media tools that engage people in noticing what’s happening on their streets, the importance of aggregating local data and making it widely available, vigilance in holding federal agencies accountable, hyper-local enviro-activism paired with long-term thinking, setting up community ‘hubs’ for neighbors to mutually problem solve, and the always central role of food to a shared urban life. These are only a few of the many examples of granular resilience-building that New Orleans manifested in its recovery from the shocks of 2005. Resourceful approaches like these can be found in cities around the world, where home-grown approaches to urban livability and resilience are encouraged. In the absence of any large-scale public schemes, the people of this city were compelled to incubate their own resilience, locally, and in the process fostered new forms of urban innovation. 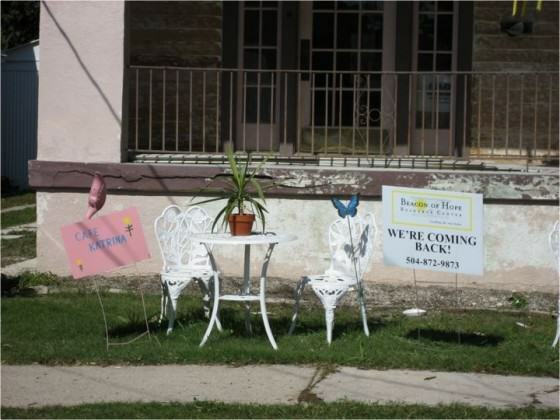 In post-Katrina New Orleans, informal, improvised approaches became the new normal. Part of the fragility there continues to be how to support a transition to more reliably funded and scaled approaches, while still protecting the vibrant and informal without killing it with formality and predictability. Shortly after I arrived there I began to refer to New Orleans as a ‘prophetic city’, exposing as it did challenges and opportunities to sustain and recreate urban life. Eight years ago, prophetic seemed to fit. But now, it seems almost old news, in the wake of these last few years when so many cities around the world have been faced with seemingly insurmountable challenges. Three years in Katrina, Karen Gadbois (above) said to me she had spent the first few years thinking that at any moment the cavalry was going to come over the hill and solve things. But then she realized, they weren’t, and that ‘we were the ones we’d been waiting for’. This is why granular resilience matters: because large system fixes are slow, elusive, and questionably reliable. It is a much better bet that we look for ways now to enable the local innovation that produces the economic, social, environmental and cultural resilience our cities need. Once rooted, the best approaches can be ramped up, copied and adapted to suit new circumstances, forming an urban ecology of innovation. 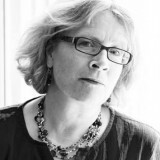 Mary W. Rowe is an urbanist and civic entrepreneur. She currently lives in Toronto, Canada, the traditional territories of the Anishinabewaki, Huron-Wendat and Haudenosauneega Confederacy, and works with government, business and civil society organizations to strengthen the economic, social, cultural and environmental resilience of the city and its neighborhoods. Thanks for all your good work in New Orleans and even more thanks for highlighting these outstanding ‘Good Guys’. There is nothing more valuable than when a community finds its voice than whena communities voice is heard amongst the masses. 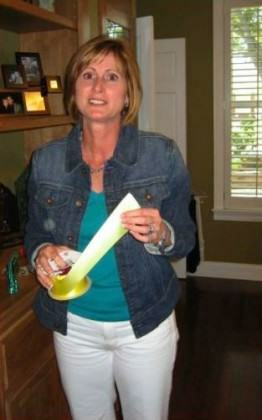 Mary Rowe thanks for providing the megaphone for New Orleans to speak to the masses! Thanks for the shout out Mary. And for remembering New Orleans in all that you do. We’re still hard at work, rebuilding. Probably will be for the rest of our lives. Hi Mary Thanks for the post. Remarkably similar to what has happened in Christchurch post earthquakes. Lots to learn on both counts! Mary, thank you for your assistance in bringing together all of us, grains of sand. Together, we’re building a castle. It’s not finished yet, but we’re getting closer every day.